Having written several detailed reviews of Oracle Press’ Oracle Big Data Handbook (links below) I thought it useful to produce a summary. Over all is a very insightful and informative book covering the range of technologies that Oracle offers to address the ‘Big Data’ space from a number of view points such hardware with the Big Data Appliance (BDA), software with NoSQL, Enterprise R and Hadoop along with the various adapters (e.g. ODI) and existing product features that existing products make available to support the big data story and contribute to make a cohesive ecosystem. The book looks beyond the technologies classically linked to the ‘Big Data’ term to explore products such as Endeca. I like the act that the book tries to explain the rational behind some of the approaches adopted and the associated value propositions. Finally book looks at governance, maturity and architectural capabilities. All of which makes for an informative and insightful book. The book isn’t flawless a few challenges that can make the reading a little frustrating occasionally (at least for me as I went cover to cover), for example,looking at the Big Data Appliance we seem to revisit the hardware specifications multiple times. The data governance perspective is data governance not specific to big data in my opinion. Occasionally the book seems to jump about when explaining a number of related areas which means that using the book as more a reference isn’t so easy. Don’t get me wrong these issues are hugely out weighed by the value it brings. After an excellent start in Part 1 of Oracle Press’ Oracle Big Data Handbook (reviewed here). 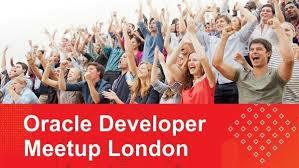 Part 2 moves on to looking at Apache Hadoop, Oracle’s Big Data Appliance and Oracle’s NoSQL offerings. So chapter 3 provides a brilliant overview of Hadoop and the echo system that has been developed around it. Addressing the divergent versions of Map Reduce leading to the likes of YARN. Touching on how commericalised versions of Hadoop have been taken forward with this (such as Cloudera). Moving onto to describe the core solution components such as Node Managers and the relationship to hardware and the use of more commodity kit rather than using nice expensive SAN technology. So now we have good (pretty much uncoloured by Oracle) view of Hadoop. Which leads into the the next chapter (chapter 4) which looks at why Oracle have taken the approach of an Appliance (which could be seen as contrary to the previous stated adoption of commodity kit). 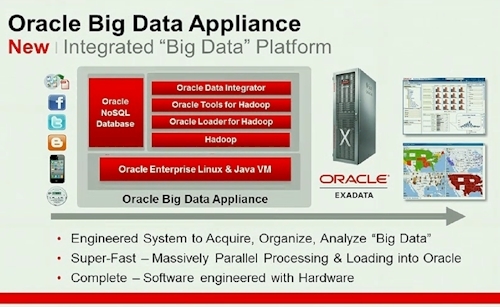 So as you can see Oracle woven together a set of technologies into an Exadata based platform which would not only deal with Big Data Analytics but ideally support other volume scenario needs so you’re not adding another data silo. all of which fits with Oracle’s Engineered Solutions view point. The book takes on a explains the other factors involved in the BDA design – those of commercial considerations and value propositions in relation to its customer base – very refreshing to see (rather than rationalisation through technical arguments alone). The book addresses the challenge of why should I go to Oracle for big data? Which is well argued on the experience of very large relational deployments. Oracle’s contributions to Hadoop via Cloudera and so on. The chapter finishes with the argument around cost comparison between buying a comparable hardware solution to build your own cluster. Taking just list prices compared to HP and the hardware costs come in more or less the same, that’s before you account for the fact the Oracle price includes all the software. Chapter 5 addresses the deployment of the BDA, explaining the configuration process, which with the combination of a tool called Mammoth (appropriate really) and the lies of Puppet seems pretty simple as a lot of the solution is preconfigured on the box ready. all of which is reasonably well explained. my only grumble is that we do seem to revisit the details of the hardware fairly regularly as the details are again presented here, although we go into a deeper dive in the configuration. One surprise that I’d not picked up on is that Oracle have made their NoSQL solution available as open source, although a little digging might contribute to why as it has links back to Sleepycat’s BerkeleyDB that Oracle acquired (more here). 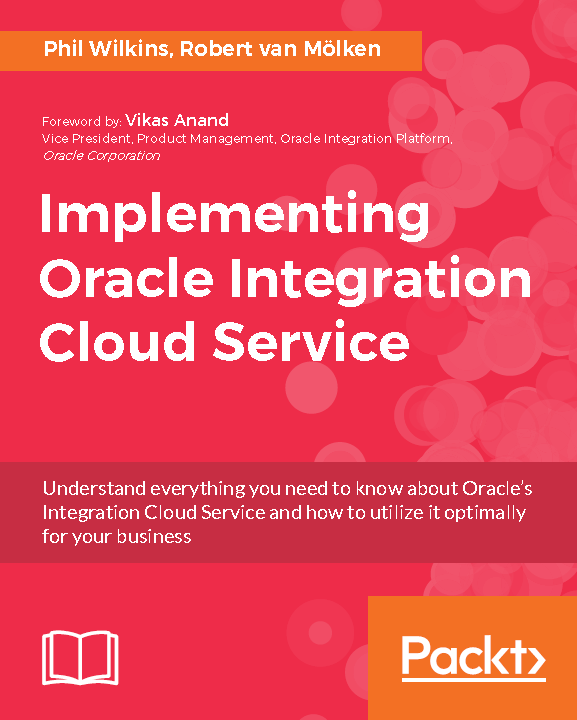 As the chapter move through the physical aspects of the deployment it also highlights in clear terms any constraints Oracle imposes to ensure that the whole appliance is supportable, the most significant of these areas is the advanced networking that is setup. Chapter 5 as it moves through deployment considerations addresses the means to know that the appliance is running properly – so we’re talking about system monitoring not just of the hardware but the distributed nature of Hadoop and Map Reduce. So a brief view of the products deployed is given. Obviously this centres on the Enterprise Manager extensions, but also the component level tooling such as Cloudera’s Hadoop Manager. Chapter 6 in many respects continues building out the view of Hadoop to describe briefly the analytics tooling both in the Oracle RDBMS, R language and data mining/discovery of Endeca. The interesting points in the chapter are about the relationship with RDBMS particularly as an enterprise data warehouse – something I’ve not seen really addressed elsewhere as the common world view seems to put Hadoop in the same camp as NoSQL which seems to be gaining the zeal and polarity that Linux vs Windows used to have when it comes to RDBMS. But I think the book makes a good case for right tool for the right job. Chapter 7 starts to drill in to how the connector package offers which consider Oracle database data transfer, combining the R language with MapReduce and ODI. The database connector aim to provide efficiency in transferring data between Hadoop and the Oracle RDBMS over say using Sqoop to transfer data to and from an Oracle database (ODI connectors, JDBC, direct OCI etc). To fully understand the explanation of how this works you do need to understand the basics of MapReduce although as the chapter progresses the relevant MapReduce operations are elaborated upon. As the chapter progresses we start being shown configuration fragments for the different connection approaches. The final chapter of this section of the book looks at the NoSQL database in detail, starting with high level ideas such as how NoSQL relates to ACID and BASE ideas, dropping down into significant (but valuable) detail by describing how clients are kept in sync through the use of separate threads picking up data about the data partitioning (sharding). Once the key components have been well described the chapter moves onto explain how Oracle has optimized the process to make the NoSQL as performant as is possible whilst providing a solution that is elastic in nature and highly resilient but still predictable in its dynamics. The chapter finishes off with considerations such as installation, how it integrates with Hadoop and OBIEE. Overall, this a very informative chapter, occasionally it feels like some of the information is being repeated but in a different structure but it isn’t the end of the world, although if you’re reading from cover to cover you need to just press on. Part 1 of the book is reviewed here. So having written a series of detailed blog entries reviewing a couple of chapters at at time I thought it might be worth just providing a very brief review. Writing a book that provides both breadth of coverage for a very large subject area as well as meaningful depth is a very difficult trick to pull off. But the authors of this book have succeeded magnificently. The book tackles the subject of basic customization that users can perform through to in-depth feature development using the Oracle SOA stack. Not to mention reporting and analytics. The book has been written in an engaging way providing context, background and Fusion Application principles and then taking examples of how to implement the different kinds of capabilities. From this book, you should have a good grasp of what to expect and how to approach Fusion application Extension work. As a result I’d recommend this book to Architects, Project Manager’s who want to understand what their development team should be doing and the risks of their approach. This would also form a good roadmap into the detail for developers starting out in the Fusion applications space. Our final detailed visit to Oracle Fusion Applications Development and Extensibility Handbook (Oracle Press) covers the final 3 chapters which engage with the Scheduler, Look and Feel customisation and the relationship with integration and service concepts (dare I use the acronym SOA). The chapter on the scheduler is pretty short, but then compared to many other chapters the size of the product/component is small. The book relates how the scheduler behaves compared to the Schedule Management offered in EBusiness. The surprising things is that each product domain (Financials, HCM, CRM etc) has its own scheduler rather than a single shared service; the book doesn’t attempt to explain the rational here which is a shame. It does describe how it deploys into each domain, where the configuration exists and how to work with the configuration of the scheduler itself (e.g. where logging goes etc) and attempts to address some obvious questions from a administration perspective. It then goes onto how to create a custom scheduled process with a worked illustration. All very well done, although I have to admit to a nagging feeling of I’m missing something – it maybe simply that deployment is very much through server administration rather than through an automated mechanism (so if you develop and test in a preproduction environment, you can package up the process of deploying config custom app to your production environment without needing to repeat the admin UI interactions, so you can be assured there is no inconsistency between deployment instances). The Look and Feel chapter is about largely applying the changes so that the product feels like part of your business’ corporate solution – important if you’re exposing any aspects of it to the outside world. So aside from the use of the tools you have the ADF controls to effectively ‘skin’ the product. The chapter provides a brief but concise view of how skinning works, in relation to the old EBusiness technologies (CLAF and UIX) and current HTML technology of CSS and the key part of ADF (Rich Faces). More importantly it points out the relevant documentation on all the sources of information, and tooling such as the skinning editor. Not to mention addressing the issue of deployment. Obviously there is a short illustration demonstrating an element of skinning. The initial emphasis on the last chapter is the reality that organisations can’t simply migrate all non Fusion Apps such as EBusines, Seibel etc to the Fusion solutions in one hit therefore you need to provide a degree of integration between solutions for as long as the transition may take. This neatly leads into the question of well how do I know what components exist to support integration, which brings OER (Oracle Enterprise Repository) into the picture. So obviously the book provides a brief overview to the use of OER. The various Fusion apps offer different interfaces for different tasks (from bulk data export to business events) so each of these ‘patterns’ are briefly explianed and as Fusion apps is offered as a SaaS solution how that might impact the ‘pattern’ availability. The chapter finishes by walking through the use of using a SCA Composite and web services to interact with a Fusion App – probably one of the most common approaches to integration at a transactional (rather than bulk) manner. The only thing missing for me would be a brief discussion on Process Integration Packs (PIPs) which leverage all of the technologies underpinning Fusion Apps into a custom package of integration operations or ready made integrations. So the final chapters provide a strong close to the book continuing to offer an excellent overview, pointing you to resources to ‘deep dive’ as necessary. Back to the the review of Oracle Fusion Applications Development and Extensibility Handbook (Oracle Press) , Chapters 9 & 10 take us from developing ADF based extensions to BPM and developing capabilities using a lot more of the SOA based building blocks such as Human Workflow. The BPM chapter isn’t huge as actually the real effort behind BPM driven processes are more SOA based development. But the book does step back to explain Oracle’s history in the BPM and BPMN space and how Fusion Apps work using these technologies. So what we have is a good chapter more focusing on ideas and principles. Chapter 10 naturally takes us into building full extensions which could be implementing the activities needed to realise a BPMN processes. The chapter is almost two separate halves, the first being the ideas and approaches adopted by Fusion Apps – such as the triggering of processes through EDN and onto into approval framework and how it compared to the preFusion products. The second half of the chapter turns all of this on practical steps in the various tools to realize functional extensions in a series of comprehensive steps. Finally the chapter tackles the issues of deploying the customisation and the implications to patching and updating your Fusion Apps. So yet again the authors have managed to cover a lot of ideas very effectively providing sufficient insight that you should able to find the necessary information if you’re working with a Fusion application not discussed here. 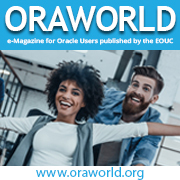 As a result of my involvement with the UK Oracle User Group I have been given the opportunity to review Oracle Press’ Oracle Big Data Handbook. I have to admit that I am not a Big Data expert (and reviewing this book was an opportunity to build my knowledge a bit more). So, Chapter 1 starts providing a brief but succinct history of Big Data (from Google’s work with Map Reduce and lesser known technologies such as Swazall and Dremel), the rise of Hadoop. The primary value proposition of Big Data is briefly explored (highlighting the point that actually RDBMS such as Oracle can accommodate lots of data when in a structured form) but Big Data is the nexus of volume, speed, variety (multiple structures, semi structured and unstructured). The book does suggest that in addition to these factors the data Value (a structured transaction have a lot more value than the same quantity of unstructured data which delivers its value when in context with other data). From here, a brief look at the Oracle BigData landscape which leads nicely to having a layout for the chapters of the book. Ranging from the Oracle Engineered Systems idea to it’s adoption Hadoop through Cloudera, NoData and onto how this becomes a joined up solution with the likes of OBIEE. Passing through Oracle’s extended version of the R language. In all a brief, succinct and informative intro. Chapter 2, takes us on the journey of the business value of Big Data ideas, taking us through some examples such as MCI’s campaign the 1990s to develop insight by mining for friends and family information. In its day we called this sort of thing data mining, now its another aspect of big data. The chapter moves onto describing an idea of Information Chain Reaction (ICR) – where output from one stage produces a response in the next. With communication, change and connection being the primary triggers. The authors make an interesting point, in the book about taking the metrics for volumes of traffic on social sites with a pinch of salt, not because of the possibility of overstatement (although that is a possibility, after all users is an easy measure for investors) but how and when the measurement is done, and even just changes in API or user process. For example adopting an approach that drives users to just reverify their details regularly could create more user activity although deliver no more real information. Most importantly what is the value of the information/traffic to you.